Anyone who has spent a long day sitting in front of a computer will likely know the feeling of Computer Eye Syndrome. Even if you don't have eye sight problems your vision feels a little blurry when you look away from the screen, your eyes feel tired, dry or watery, sore and sometimes itchy. As many of us spend a entire working hours in front of computer it's important to look after our bodies if we want to avoid long term associated illnesses with too much energy zapping computer time. Sitting at least an arm's length away from the screen, taking regular breaks and avoiding glare on the screen from surrounding light source by positioning your computer or lamp at a suitable angle will help reduce eye irritation. As we generally stare more, i.e. 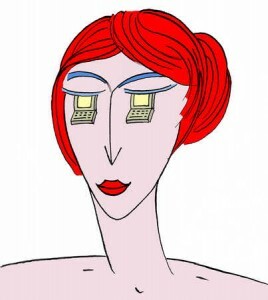 blink less frequently, when looking at a computer it's important to keep eyes moisturised. Do this either naturally by remembering to blink or using mild eye drops. Taking a moment to freshen up the skin around the eyes will also help. A spray toner or nourishing eye cream can help to cool down tired, burning and sensitive skin around the eyes. Eating plenty of foods rich in lutein and zeaxanthin will help prevent loss of vision by reducing the risk of muscular degeneration that naturally occurs as we age. Foods like Spinach, sweetcorn, kale and orange peppers are high in these nutrients. Also bilberry extract is believed to improve both normal and night vision so supplements of this may help computer eyes in the long run.